Volvo Truck dealer Dennison Commercials Ltd, has supplied a total for 70 new trucks to two prominent hauliers McBurney Transport Group and Woodside Group. McBurney’s latest delivery of 25 Volvo tractor-units includes 15 x FHs, 9 x Volvo FMs and a stunning Ailsa 50th anniversary Edition Volvo FH. 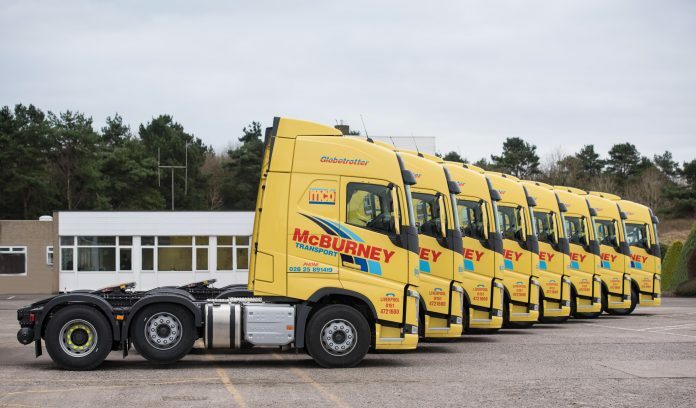 The new order consists of a combination of replacement and additional vehicles that join McBurney Transport Group’s sizeable fleet of over 300 vehicles, based at depots in Northern Ireland, England and the Republic of Ireland. The FM and FH units feature similar specifications and the 6×2 pusher axles chassis are all powered by Volvo’s D13K 13-litre engine rated at 500hp. Globetrotter Cabs, sliding fifth wheels and Michelin tyres. The special Volvo FH16-750 Ailsa Edition is finished with a Golden Fleece paint colour and the 6×2 tractor also has a Globetrotter XL Cab, 12 speed I-Shift automated manual transmission system and Volvo’s unique Dynamic Steering system. The limited-edition truck’s extensive interior specification includes a Driving ++ Package, a rotating and heated passenger seat, in addition to I-Park Cool, Volvo’s stationary air conditioning system. 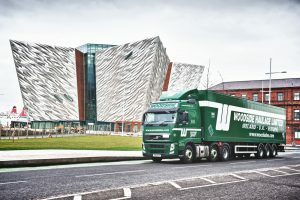 Leading transport and logistics company, the Woodside Group, has completed the purchase of 45 new Volvo trucks from Dennison Commercials. The new, mostly Volvo FH tractor units join the 200-strong Woodside fleet to perform a variety of specialist transport functions. The trailer fleet includes curtainsiders, box vans, walking floor trailers, liquid tanks, powder tanks and car transporters. The vehicles were mostly FH-460 Globetrotter 6×2 tractor units with I-Shift, tinted glass, leather steering wheel and with air-con, fixed fifth wheel plate, although there were some 4×2 and some had Globetrotter XLs. Four of the trucks also had Estepe axles, to reduce overall weight and there were some FE 4×2 240 18t curtainsiders and some FM-460 4×2 low-roof sleeper cab rigids with I-Shift for car transporters. Dennisons also recently undertook the conversion of two Woodside vehicles at the company’s bodyshop, transferring existing car transporter superstructures to the new rigid/trailer combination trucks each capable of carrying 13 cars or vans.